Looking for a new job can be daunting, especially if you have limited experience. But everyone has to start somewhere, and you will be a step ahead if you can show potential employers that you are motivated to work hard and have the ability to get on well with other people. One way of highlighting these soft skills is on your CV or application form. If you’re a student or graduate with limited work experience, referencing your soft skills as well as your academic qualifications on your CV helps a potential employer get a better idea of the person behind the CV and the breadth of skills they have to offer their business or organisation. You may find it helpful to use the following CV template to help you to create a CV that shows potential employers all your DofE skills and experience. You can download the CV Template here..
You can use the following guide to help you to fill out the CV template. You may also find it useful to refer to the following example. Tip: some jobs may require you to fill in an application form, rather than submitting your CV. You can find useful tips for this here. 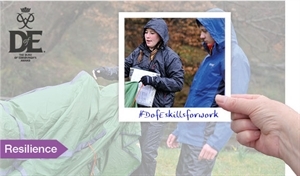 Don’t forget, you should also let unis and employers know if you’ve continued any of your DofE activities (volunteering, keeping fit etc.) after achieving your Award; this demonstrates that you’ve set up good habits for life and shows that you’ve got staying power.